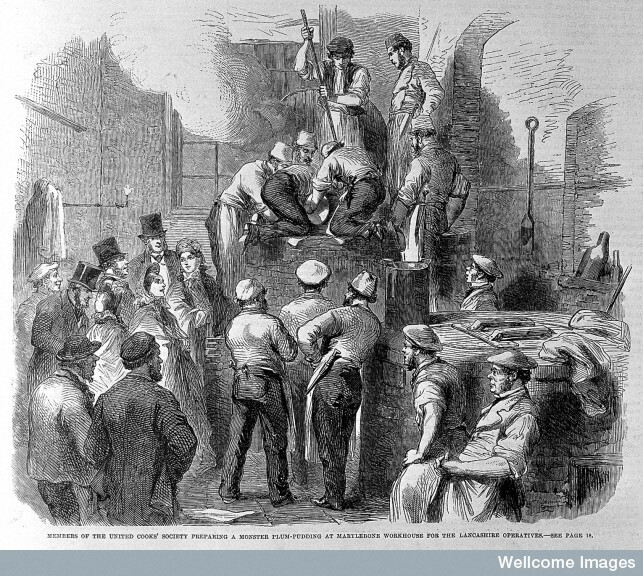 “Members of the United Cooks’ Society preparing a monster plum pudding at Marylebone Workhouse for the Lancashire Operatives,” in The Illustrated London News (1863). Image courtesy of the Wellcome Library, London. This is the second part of a post which appeared on Tuesday, 10 May. As Edward Ostler reported to the 1834 Royal Commission, ‘humanity dictates that the inmates of a workhouse should be fed quite as well as a labourer’s family’, and the food, whilst wholesome, should be ‘of the plainest description’. Ostler described the pre-1834 diet in most workhouses as meat, broth and pea soup, each for two days, with fish on the seventh day. No amounts were given, but Ostler also reported that the diet should be ‘sufficient’. In earlier years of the ‘new’ poor law some guardians had attempted (unsuccessfully) to instigate a system whereby unmarried women of ‘profligate habits’, who had been delivered of two or more children in the workhouse, should be given a reduced diet and wear a ‘badge’ to differentiate them from other women. Following the formation poor law unions in 1834, the central authorities expected that all meals would be weighed and measured to ensure the amounts stipulated were received by the paupers. Whether or not the quantities were ‘sufficient’ is, and was somewhat subjective. Although the central authorities envisaged that workhouse diets should follow the principle of less eligibility and not be of better quality or higher quantity than the ‘ordinary’ diet of a labourer’s family, this proved unfeasible as many of these labourers’ diets were too poor to sustain health. Although the diets within workhouses appear ‘sufficient’, the food offered was indeed monotonous; the disallowance of a delicacy such as treacle would have been a blow to the four girls mentioned above. The workhouse dietary for 1837 allowed for five ounces of meat three times a week, one and a half pints of soup three times a week and 12 ounces of rice or suet pudding weekly. Breakfasts were 6 ounces of bread and one and a half pints of gruel and supper either one and a half pints of broth or two ounces of cheese with 7 ounces of bread. Some workhouse soups were a little suspect, as a poor law inspector found that dirty clothes were being boiled up on the stove in a pan next to the broth, and he wisely declined to sample the soup as a result. Over the years, the main changes in workhouse diets were in the variety of foods and quantities more or less remained the same with a little more protein and vegetables and a little fewer carbohydrates. Some dishes were made more palatable, such as the suet pudding, to which was added more suet along with currants and spices. By the 1870s, ‘pie crust’, tea and butter once a week were included in the children’s dietary. The early twentieth century diet of children also included cocoa, porridge, sugar, cake, biscuits, roast beef and mutton, savoury mince, barley soup, bread pudding, boiled bacon and rice milk. Food was also used as reward as well as punishment. Various treats were given to children throughout the year and most included food that could be considered an indulgence. These treats were promoted as being obtained by good behaviour and by conforming to the projected ethos of work, independence and thrift as adults. One annual trip to a beach also saw the children ‘plentifully regaled with tea and plumcake’ and special teas were often arranged. The early 20th century diet also included cocoa, porridge, sugar, cake, biscuits, roast beef and mutton, ‘scouse’, savoury mince, barley soup, bread pudding, boiled bacon and rice milk. The local press always appeared deeply moved by both the children’s plight and the guardians’ beneficence. Concerning an earlier outing to Caswell Bay, the Welsh newspaper The Cambrian was ‘glad to find’ that the guardians showed ‘deep interest and kindness towards the children confined in our union’ and on a similar occasion it was reported that the ‘poor’ children ‘gambolled over the hill right merrily’. So, gruel was a workhouse staple, as it was across Britain for all classes. However, benighted workhouse inmates never had to rely on it as their only form of nutrition. What is gruel anyway? Or ‘skilly’ as it was often called. Basically, its just a watery porridge; here is an 1872 recipe if you want to try it at home. 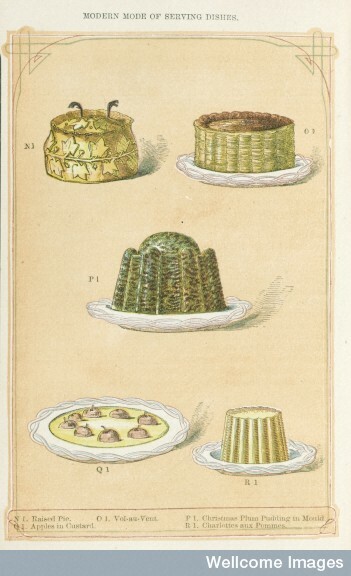 “A selection of puddings,” in The Book of Household Management by Mrs Beeton (London, 1861). Image courtesy of the Wellcome Library, London. The tedium of these meals was relieved by special teas which were organised by local ladies and on outings in which food was part of the treat. One annual Whitsun trip to a local beach saw children ‘plentifully regaled with tea and plum cake’. At Christmas, guardians would organise a dinner of roast beef and plum pudding for all workhouse inmates, and oranges was also a favoured gift from medical officers. Here’s a recipe for Christmas pudding that might beat us all. Although these workhouse food strategies could be described as humane, their main objective was to curtail what was perceived as a ‘once a pauper, always a pauper’ culture thought prevalent among the destitute in Victorian Britain. The Cambrian, 23 July 1858, 24 May 1861. Royal Commission of Inquiry into Administration and Practical Operation of Poor Laws, 1834, appendix C, 173. WGAS, U/S 1/1, Guardians’ Minutes, 20 June, 4 July 1850. TNA, MH12/16437, 29 May 1837. WGAS, U/S 1/33, 20 December 1900. The Cambrian, 15 June 1860. This is so interesting, looks like a healthy diet but how could anyone get through a pint and a half of gruel for breakfast? No central heating or cars burnt off the calories I guess. Next PostNext A Stitch in Thyme? : Why Are There So Few Knitting Patterns in Recipe Books?